Fredericksburg area resident and Kerrville 2000 New Folk Finalist Stuart Whitford is a family man with a lifelong interest in music, who returned to songwriting and performing in 1997 after a 15 year absence. Stuart's tinkering with words and music came together in Vertical Land - an independently released CD of original songs and instrumentals from the heart that reflect many of the musical, cultural, geographical, and personal influences on Stuart's life. Since its release, Vertical Land has garnered praise from the likes of Dobro Master Jerry Douglas ("a wonderful record"), songwriter Kate Campbell ("truly one of the best independent projects I've heard"), and Folk and Bluegrass DJs across the United States and Canada ("damned fine album!" Connie Bowblis/WKNH/NH, "excellent...the entire CD is a pleasure to listen to" Dianna Morris/KKUP/SF, "really great stuff!" John Davis/KPFK/LA, "soaring, beautiful melodies" Dave Higgs/WPLN/Nashville, "a captivating songwriter, guitarist, and mandolinist" the Prism Coffeehouse/ Charlottesville). Joining Stuart will be four of the talented musicians who helped in the recording of Vertical Land - fellow singer, songwriter, and guitarist Jennifer Peart, multi-instrumentalist Kent Ippolito, bassist/vocalist Henry Hubbard, and guitarist Tom Groseclose. 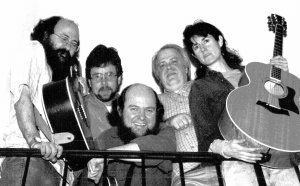 As the band Vertical Land, over the past two years these musicians have put together a show that features the tight three part harmonies of Stuart, Jennifer, and Henry and the wonderfully woven guitar, mandolin, mandola, and bass playing of all.